Fusarium head blight (scab) severity varied across the country last year, but lots of rain right after heading caused severe cases to develop in parts of the Central and Northern Plains. Some areas experienced consecutive days of rain just before flowering, making the already narrow fungicide application window even smaller. As a result, many growers saw decreased yield and increased DON from head scab. University experts and reports provided to the U.S. Wheat and Barley Scab Initiative (USWBSI) show how the Northern and Central Plains were affected by head scab last season. SD and ND were the states most impacted by head scab. SD had significant rain right after heading, which caused severe cases of head scab to develop and yields to suffer. Southeast ND also had reports of head scab with some growers experiencing yield loss and dockage due to high Deoxynivalenol (DON) levels. As 2019 planning kicks off, imagine how having more time to manage head scab would change your operation. 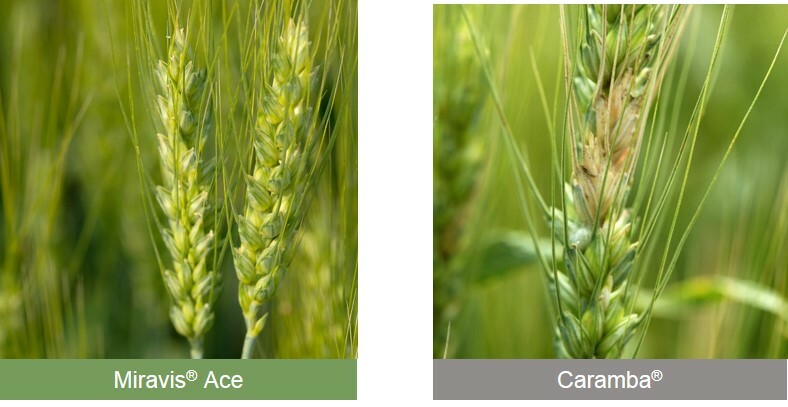 For the first time ever, you can spray for head scab as early as 50% head emergence through flowering because Miravis® Ace fungicide offers never-seen-before residual control. Powered by the active ingredient Adepidyn® fungicide, which is the first and only molecule with an SDHI mode of action available for head scab control, and propiconazole, using Miravis Ace will completely change how you manage head scab while helping drive yield up and DON down. Take the pressure out of head scab management in 2019 and give yourself more time with this first-of-its-kind fungicide. *Caramba is not labeled for use at 50% head emergence, and no recommendation or suggestion for use at this timing is being made. Data and images are intended solely for comparison at this application timing with Miravis Ace, which is labeled for use as early as 50% head emergence. Miravis Ace is currently not registered and may not be offered for sale, sold or used as a formulated premix product in the U.S. Miravis Ace is sold as a combination of separately registered products: Miravis Ace A and Miravis Ace B fungicides. All other trademarks used herein are the property of their respective owners.